Typically each year we raise approximately 10-12 pigs depending on the number born. The pigs are raised for meat, which is available for sale through our Farm Store. The manure they and other animals on our farm produce is used to fertilize the land which is needed to produce our crops. Over the summer and early fall, the public is welcome to visit the pigs and interact with them. There is a strong entertainment "ahhh aren't they cute?" factor to this, but it's also an opportunity for people to get up close to a pig, see what they look like, how they behave and grow. 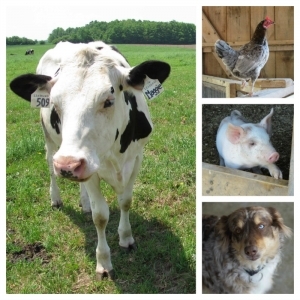 Questions are raised about their role on the farm and how they become food. Although not everyone agrees on this, these questions create important conversations, and an opportunity for education. It's important for everyone to think about and question where their food comes from. The pigs stay inside the Demonstration Barn when the piglets are small, and then move to a pasture when they are approximately 1 month old. They are raised using organic practices. 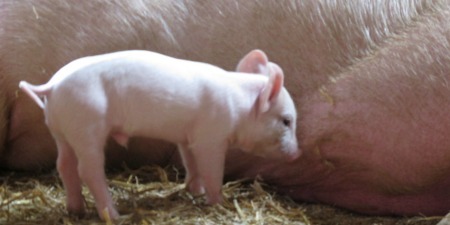 Overnight, starting on Saturday May 26th, our sow gave birth to 12 piglets. One was stillborn, and unfortunately a second died the next day. We know from comments on Facebook, that followers are sad to hear about these deaths. Although we know death is never an easy topic, we wanted to take a moment to explain some of the risks for piglets. Stillbirths are fairly common, usually 1-2 piglets in a litter may be stillborn. In this case, it was not obvious the reason why the piglet died before birth and it appeared that the piglet died later in the pregnancy. Sometimes a piglet may die earlier in the pregnancy and this can be judged by the stage of development and size of the piglet upon birth. Also the last piglet to be born is usually at greater risk of death because the after birth may detach and come out at the same time and can suffocate the piglet while they are being born. In this case, Martin happened to arrive home late and notice the sow was starting to give birth so he stayed up and monitored the births. If the sow had given birth on her own without monitoring we would expect things would have still gone well, but it's good to have someone there just in case. With Martin on hand, he was able to make sure that after each piglet was born that it was breathing and placed under a heat lamp to stay warm. A birth can take several hours, in this case from approximately 11pm to 2am. If the piglets are not coming out then in rare cases we might have to reach in and pull the piglets out. How long is a pigs pregnancy? 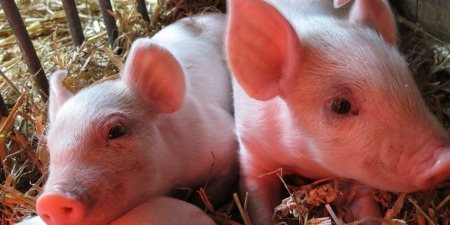 A pigs' pregnancy lasts for 3 months, plus 3 weeks, plus 3 days. Do you use gestational birthing pens? No we do not use gestational birthing pens. The sow has a pen approximately 10' by 10' to reside in while pregnant and when the piglets are small. Did your sow have mastitis? Sally (the sow) did not have mastitis. This was a concern to a follower when we posted the above picture on Facebook. 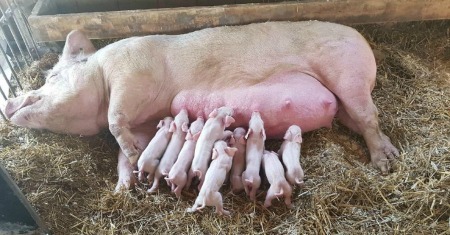 The angle in the picture was taken from slightly distorts her udder shape but also the piglets hadn't made it down to that end yet to drink the milk. Mastitis is an infection of the udder, caused by bacteria. 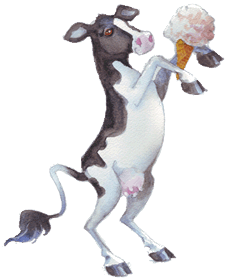 It is painful for the animal, results in a large reduction or complete stoppage of milk, and leads to a high fever. The piglets don't get enough food and start to decline as well. Overall, mastitis is more common in cows, although not that common in our herd because of various preventative measures we take and the level of nutrition that we provide. It is more rare in pigs. Almost always, either Arwa or Martin are on the farm. If you are visiting and have a concern please ask to speak to them, and they will do their best to meet with you. Risks in the first few weeks. On one hand it's important that the piglets can easily find their mother to nurse. Before giving birth a sow will typically create a nest of straw around her so that as she gives birth the piglets can't wander too far from her. However a straw nest also increases their risk of getting laid on which is one of the biggest challenges in their first few weeks. Our sow is approximately 300 pounds and is not a nimble flexible mover. If she lays down on a piglet, which is approximately 1 pound or less at birth, she may not realize it and crush it. If she starts to lay on a piglet and it has the opportunity to squeal, she will try to get up again, although she is not a fast mover and there is still the risk of death. We provide a heat lamp in the pen for the piglets. This lamp provides a warm gathering spot for the piglets a short distance away from the sow and helps reduce the risk of them being laid on. However with the warm weather in late May, this was not the attraction it normally is, so the piglets were running around and more likely to be near the sow when she laid down. We have put up a board, in the sows' pen that is off the ground and away from the wall. This way if the sow starts to lay down against it, the piglets can escape under the board and through the gap. However, we are unable to monitor the sow and piglets at every moment and unfortunately she did lay on a piglet late Sunday, May 27th. Despite the 2 deaths, 10 active, healthy piglets remain. We expect that the remaining piglets will nurse from their mother for the next 6-7 weeks before their mother has had enough of their teeth and starts rejecting their attempts to nurse – sometimes quite grumpily. Currently they are in the Demonstration Barn to be seen, and later on will be provided access to the outdoors and then moved to a larger outdoor pen in late June / early July. Are the male pigs castrated? Yes. Male pigs are castrated within a week of birth so it is as least invasive as possible. Our Field Manager is also an experienced pig farmer so he does the procedure for us. If we did not castrate the male pigs, their meat would have a strong flavor that most people do not like. We do not clip our pigs teeth or tails. This is a more common procedure in larger pig farms to limit the possibility of pigs chewing on each other. We have never had an issue with this at our farm since they have room to move around and have lots of distractions such as straw, or digging things up in the field. Ear tags are not necessary as we raise a small number of pigs. What do the pigs eat? In the pasture they enjoy digging and consuming various grasses, weeds, grubs and insects. In addition, they receive organic corn and grain daily to supplement their diet. All the corn and grain is grown right on the farm. Occasionally, they receive minerals for added nutrition and extruded soybean meal to provide them with a protein boost. Where did the sow come from? The sow is purchased from a farm approximately 30 minutes from ours and is already pregnant when she arrives at the farm. We are unable to keep pigs over winter so we purchase a new sow each year. We use a local small abattoir located 10 minutes from the farm. When transported to the butcher, the pigs are loaded as a group. The promise of some treats in the trailer means they walk on without issue. Electric prods are not used and physical force is not required. Because they travel as a group on the trailer, they remain calm during transportation. Their death is quick with minimal stress. If you have a question or concern, the best way to reach us is via email at info@mapletonsorganic.ca .